EBay (s ebay) and PayPal formally unveiled their X.commerce platform, an ambitious attempt to bridge online and offline commerce and arm developers and merchants with a host of tools to help part consumers from their money. The platform is wide ranging and includes a number of components, from a new PayPal sign-in called PayPal Access that simplifies registration on commerce sites for payments to a new suite of tools that packages a lot of eBay’s recent acquisitions like Magento, Red Laser, Milo and WHERE. The whole idea is to become an end-to-end resource for all merchants and developers, helping them address opportunities as commerce goes beyond digital to local, social and mobile. By pooling all of its resources spread among PayPal, eBay and recent acquisitions GSI and Magento, eBay can create one “commerce operating system” for developers of all stripes, instead of addressing each developer community on these various platforms. And it can be a single resource for merchants, from online sellers looking to add mobile or local capabilities to traditional offline retailers looking to add more web tools for online shopping, discovery and payments. Overall, it puts eBay into a new mode as a technology provider to merchants and developers, not simply a retailer itself. This is a big opportunity for PayPal, which has been a major player in online commerce but is now looking to branch out to the world of offline transactions. 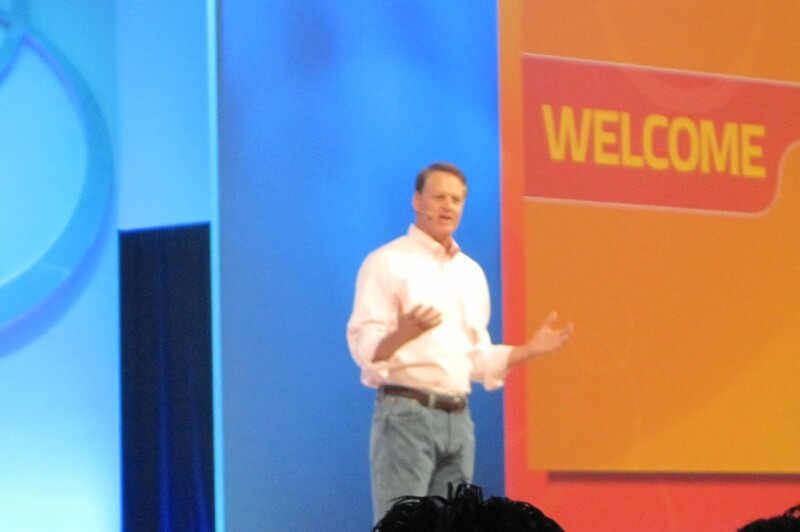 EBay CEO John Donahoe said about half of transactions are now affected by the web in some form whether through research, location finding or payments, creating a $10 trillion opportunity as offline and online commerce blends together. The key, he said, is arming merchants with the right tools and data that help them optimize their sales efforts. So a local retailer, for example, can easily set up an online shop using Magento. And they can integrate other tools like Milo or RedLaser, which can help consumers find local inventory. In a bid to improve online sales, X.commerce has a new commerce identity log-in called PayPal Access, that allows users to sign in for a transaction with just their email address and password to complete a transaction at sites that utilize PayPal Access. It’s like Facebook Connect but designed to speed up and secure transactions, doing away with separate registrations for each site that can lead to abandoned sales. Magento is also opening up its Magento Connect extension store to its online customers of Magento Go, allowing developers who build for Magento to sell unique extensions directly to merchants who connect through the cloud. Business customers can just buy an extension and plug it in easily on their to site. Next year, X.commerce will introduce a bigger app store that will allow developers to sell apps across the entire platform, not just on Magento. 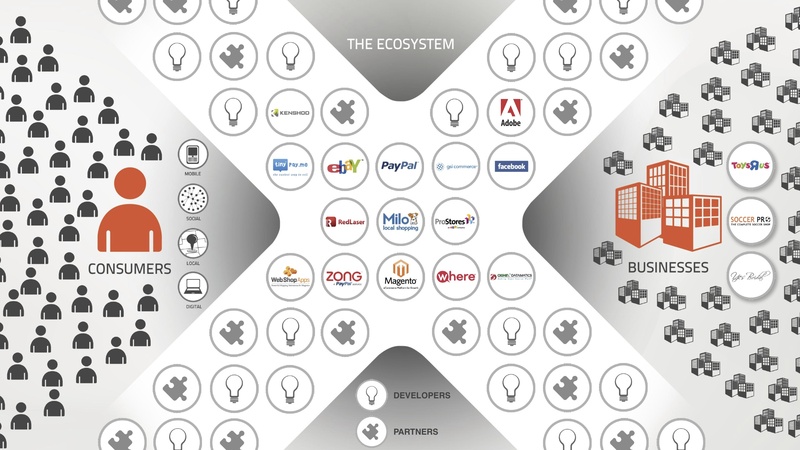 While X.commerce has a number of tools, the idea is to engage developers to build out the commerce stack. In that vein, EBay unveiled some new partnerships for X.commerce including Adobe (s adbe), which will drop in its Omniture analytics tool into Magento so merchants can better track customer engagement. Kenshoo, a demand generation provider, will integrate with Magento so merchants can quickly create ads for products that will automatically appear on Facebook, Google (s goog) or Yahoo (s yhoo). Facebook is also getting in the act, allowing developers to enable the new expanded Facebook Open Graph through Magento so businesses can easily let users share more interactions beyond just liking a product on Facebook. GSI support for Open Graph is also in the works. This is again an important move for eBay and PayPal. They understand that there’s a big opportunity to leverage all the changes in the retail space. EBay will continue to sell, connecting merchants and consumers, but it really looks like the company’s future is enabling transactions wherever they occur. Donahoe made clear a couple times that eBay wants to be an enabler here and won’t compete with developers and merchants. Toward this goal, you should expect more acquisitions by eBay, which has been on a tear lately but will surely be adding more tools to its tool kit. I think the move makes sense for eBay and PayPal. By building out its platform, it can do much more than just capitalize on sales through eBay or taking a cut of PayPal transactions. It can help fuel a whole lot more sales online and offline and sets up X.commerce to be the one stop shop for business looking to generate more transactions. X.commerce will need to keep evolving and become a robust and broad resource for customers and developers. And eBay will need to make sure it keeps developers happy by giving them a chance to make money without worries of competing against the platform holder. X.commerce will also face more competition in the market for offline transactions from the likes of Google, Isis and other payment services which are also trying to combine mobile payments, loyalty, CRM and marketing. But it looks like a good start in trying to take advantage of all the changes in the world of commerce. 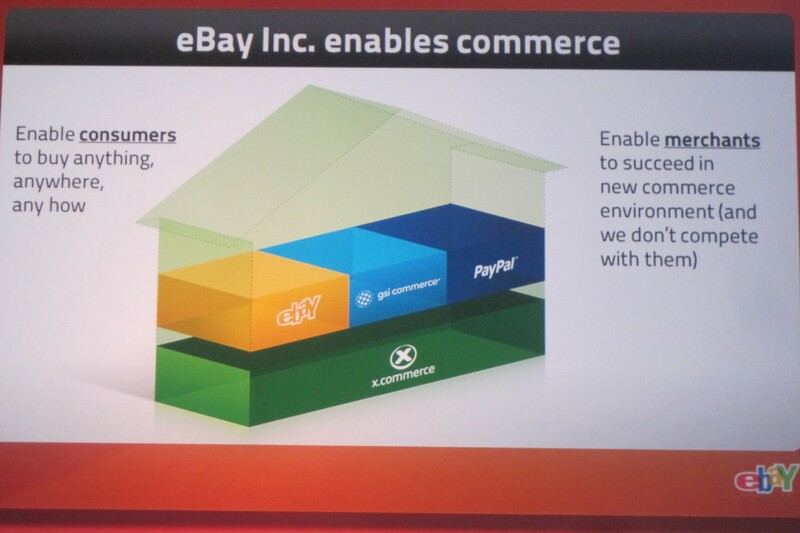 What’s new in x.commerce, is it a combination of ebay’s own storefront and magento? I couldnt agree more Philip! They are the very LAST service provider I want to have offer me anything remotely end to end in a financial services arena! I co-deved a social site that had to use Paypal for processing and they were the worst developer service experience I have ever even heard of! If they hadnt been the first one in the industry and been bought and shoved down the throats of Ebayers then they would have been long dead and gone and whomever would have filled the gap would have made the payments processing industry a better place no matter who they were!